Delinquencies and charge-offs on business loans have been growing for the past year — a warning to investors. Previously, we warned that growth in business loans not only distorts valuation ratios but also increases the vulnerability of markets and companies with higher debt/equity ratios. See: Investors, be alert for these two credit trends. Today, we add that loan delinquencies* have already turned up from their bottom. For investors, this reflects growing risk in borrowing companies, the economy and banks. 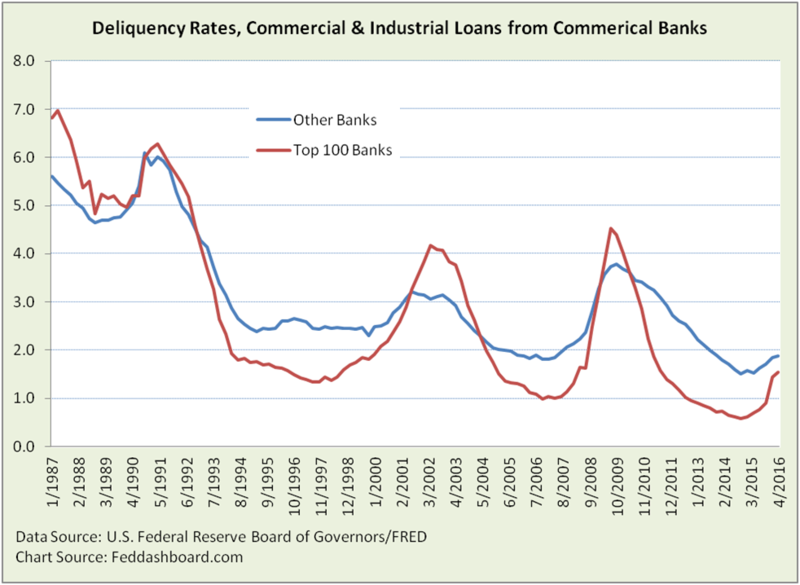 Historically, delinquencies grow with loan volume, so loan volume at U.S.-chartered commercial banks also matters. 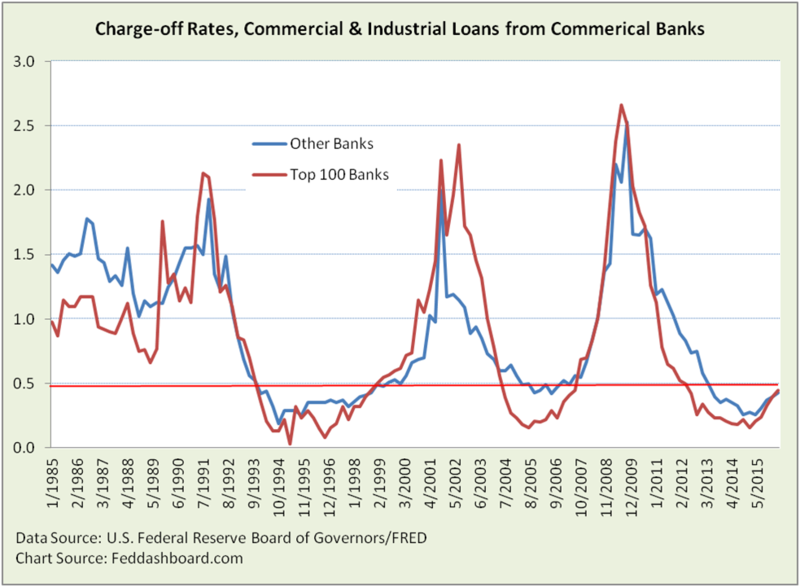 However, loan volume alone has little meaning as price and business production levels change over time. To be more comparable over time, commercial & industrial (C&I) loans are pictured relative to Nonfinancial Business Gross Value Added*. 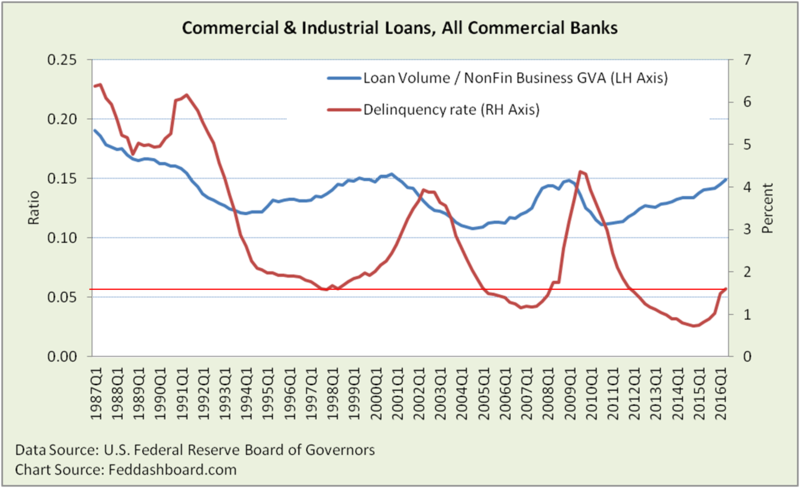 For investors tracking loan volume as part of an economic health strategy, the chart above is too narrow because it is only C&I loans at U.S. commercial banks. Taking the broader economy view of business loans at all private depository institutions*, shows debt levels today at historical highs, other than the mid-1980s. See the picture in our prior analysis. More troubling is that an increase in delinquencies tends to cascade into charge-offs, then tightening credit and then reduced business growth. So far, we’ve looked at delinquencies as a health indicator of borrowers and the economy. Investors in banks can also benefit from this indicator. While smart stock-picking means analyzing an individual bank, the Federal Reserve release of delinquencies and charge-offs provides a view of Top 100 and all other banks. The Top 100 banks usually suffer lower delinquencies. However, in the past year, the gap between the Top 100 and other banks has narrowed. What’s the picture on charge-offs? In the past year, rates have risen more rapidly among the Top 100 banks, even though they have suffered fewer charge-offs over the past several years. Current charge-off levels are above the stable ranges of prior healthy periods. Increases in delinquencies and charge-offs have also been seen in other categories of business loans, including real estate and leasing. Historically, these are ugly trends. Today, these trends are worse because of broader economic weakness and because central banks have failed to adjust to fundamental economic changes of the past two decades, including the tech and trade transformation we previously illustrated. Basel Committee and U.S. Dodd-Frank rules were intended to press banks to tighten credit faster. This tightening was reported in the July Federal Reserve Senior Loan Officer Survey. The danger is that excessive tightening will hurt economic growth. Bottom line for investors, heed the warning, focus on fundamentals both in the economy and on specific companies as we frequently show. “Delinquencies” are loans past due thirty days but accruing interest, as well as those in nonaccrual status. “Gross Value Added” is business production, or sales minus inventory, equivalent to Business Gross Domestic Product. The proportion of loans made by U.S.-chartered commercial banks relative to all private depository institutions has been falling since 1999; the difference is mostly foreign banks and U.S. credit unions.